“From our survey, it seems many Rancho Mirage residents cross the city line for breakfast, into Cathedral City, where the winner of a close race was Sunshine Café. “Smart Cathedral City patronage here shows the community appreciates and supports its well-run café. “Cheerful service is a trademark here, hard-working waitresses who seem to know most customers by name, comfortable with fast compliments, cheerful advice and super-rapid service. “Outstanding characteristics of the neighborhood eatery. Food that is good, fresh and plentiful. Mood hospitable, and energetic, with an easy, everyday welcome for regulars, a smile for newcomers. “…prices that make frequent visits both pleasant and possible. “The café has a small-town friendly atmosphere with fast kitchen service. “Sunshine…somehow was thrown together just perfectly, the essence of floppy comfort in a no-frills yet stylish neighborhood joint. “The Sunshine is clearly habit-forming….a special, homey gift for desert residents and their friends to share. “…always clean, cheery and the staff is over friendly. “Sunshine Café boasts a no-frills atmosphere, good food at reasonable prices and great service. Waitresses are quick, efficient and witty, helping create an ambience of fun. “Walk in anytime and you’re bound to find the small restaurant filled with neighborhood locals, businessmen and sometimes even a celebrity or two. 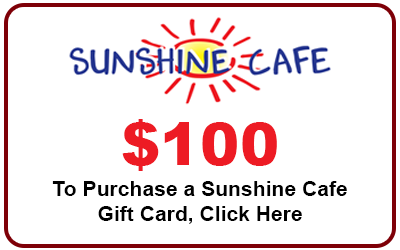 “If you’re in the neighborhood and hungry, stop in at the Sunshine Café. The prices are reasonable, the coffee’s always hot, service is friendly and after you’ve been there a couple of times, everyone really does know your name. “Sunshine Café is filled desert locals, good food and good cheer. Michelle and crew will help your day sing…or shine! “Thank you for the wonderful food… but especially the courtesy and kindness of your staff!